This article shows how to install the stand-alone restore app. We created this BackWPup Restore stand-alone app out of several reasons. For example in case your whole WordPress installation isn’t available anymore and you want to restore. You will find two files in the folder,restore.phar and StartUp.php. Upload these two files to your web server. You can use a FTP Client of your choice to upload the files. 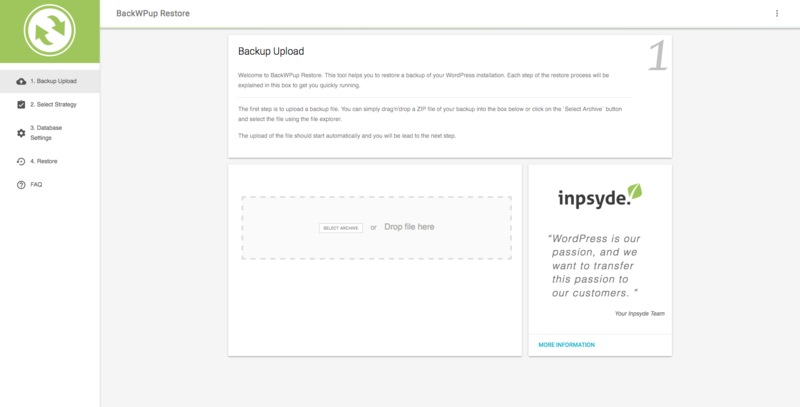 The files should be placed in the same folder as your WordPress installation. I.e. restore.phar and StartUp.php should be in the same folder like wp-config.php and wp-content/. Now we can start the restore app. Let’s assume your WordPress site is available at http://example.com/. Go to http://example.com/StartUp.php. The startup script will extract all necessary files and forward you to the restore app. The app looks like the following. You are now ready to use the restore app. Simply upload your backup and follow the described steps. Check out the article how do I use the BackWPup restore feature to get more information. The startup script might not be able to unpack restore.phar correctly. Take a look into the directory where StartUp.php and restore.phar are localized. Is there also a new restore/ folder? If no, then the script was not able to unpack the app correctly. Make sure that both files have the following file permissions: 644. If the startup script was able to create a restore/ folder, take a look into it and see if there exists a file in restore/src/App/index.php.